Effort: We put all our strength of body, mind and spirit in training. Courtesy: We show respect and kindness to each other. Patience: We understand that learning martial arts is difficult and we train patiently and show patience to others who are training. Silence: We put intense internal focus on our technique during training. Friendship: We show mutual friendship to our fellow students and instructors. We think of each other as our Tae Kwon Do family, with fellow students as brothers and sisters and instructors as respected parents. Humor: A martial arts class is a naturally intimidating environment. We diffuse some of the fear in that environment by training with fun, joy and humor. Our training is intensely serious but we also know how to laugh. Class philosophy is to make classes, fun and exciting, but at the same time to learn a serious and difficult athletic skill. We make every effort to both help kids and adults to learn as much as possible and gain as much skill as possible, but also make it fun and interesting for them. We are associated with Tae Kwon Do Chung Do Kwan schools and 9th degree black belt Grandmaster Kim, D.H. of Tucson Arizona as well as the Chung Do Kwan in Korea. Rank advancement is available, but requires additional fees for testing as well as annual membership fees to the organization (once the student attains the rank of yellow-belt). Rank Advancement, has set criteria and goals (including number of lessons and time in rank) and students need to meet those criteria before advancing. The curriculum is different for each belt rank, and students must successfully pass their test before advancing to the curriculum in the next rank. Classes are organized into terms. The kids classes have terms that are six weeks long (with some extra FREE Trial classes for some terms), and the adult classes have terms that are ten to fourteen weeks long. 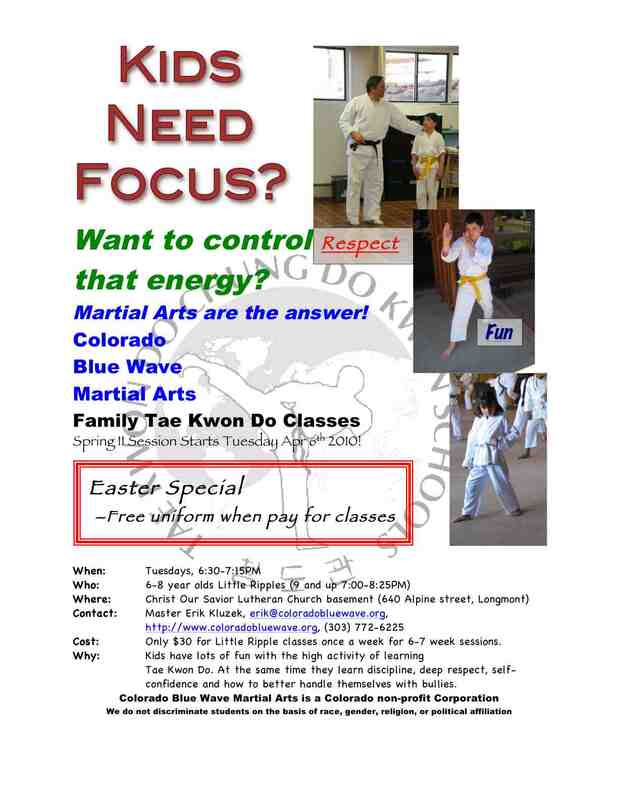 Family-TKD classes have: Fall I, Fall II, Winter, Spring I, Spring II, and Summer terms. While the adult classes have: Fall, Winter, Spring and Summer terms. We also have a break in the spring that corresponds to spring break for St-Vrain Valley School district. For information on class policies for cancelling, make-up, holidays or the like see our policies page. All students will wear a white traditional wrap-around uniform with belt. Students can purchase the uniform on their first day for $20.00. Until their uniform arrives they can use comfortable work-out clothing to train in. Ranking belts will wear the association patch and belt signifying their rank, without any other decorations. Students and parents should ensure that uniforms fit correctly and are kept clean. 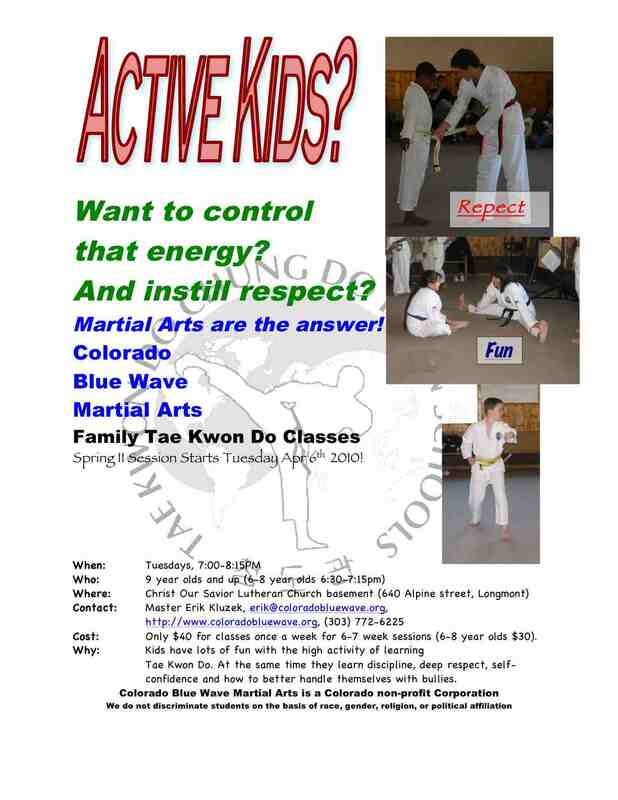 Colorado Blue Wave Martial Arts is a school that admits students of any race, gender, color, religion, national origin, ethnic origin and political affiliation to all the rights, privileges, programs and activities generally made available to students in the classes. It does not discriminate on the basis of race, gender, color, religion, national origin, ethnic origin and political affiliation in administration of its educational policies, admission policies, rank advancement policies, scholarship programs and any other school administered programs. 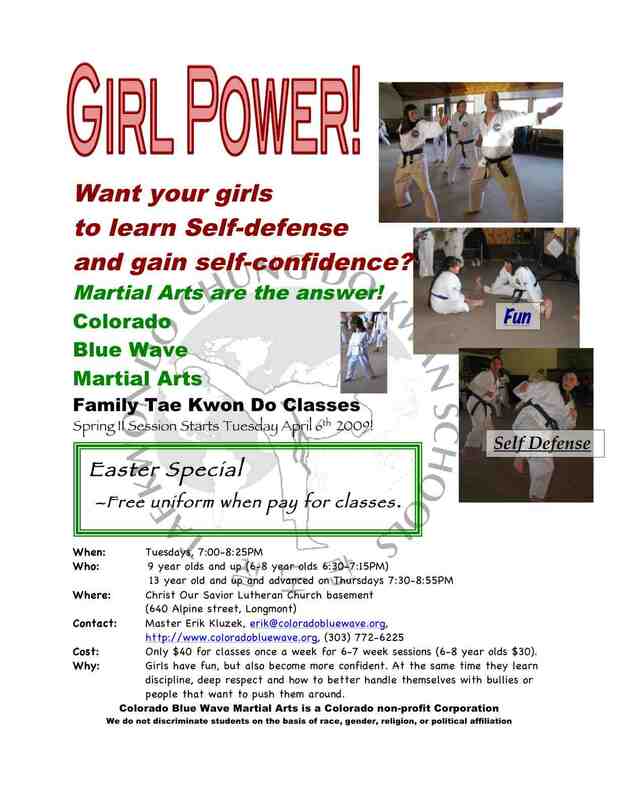 These classes are primarily taught by our head instructor 6th Degree Black Belt Master Erik Kluzek. The location is at the National Center of Atmospheric Research (NCAR) (run by the University Corporation for Atmospheric Reaserch -- UCAR) Mesa Lab in South Boulder on 1850 Table Mesa Drive and the NCAR Foothills Lab in North Boulder on Mitchell Lane off of 47th street. There is limited space and students who are employees of NCAR/UCAR/UOP take precedence. Friends and family of UCAR employees AND others can join us, but preference for classroom space goes to employees. 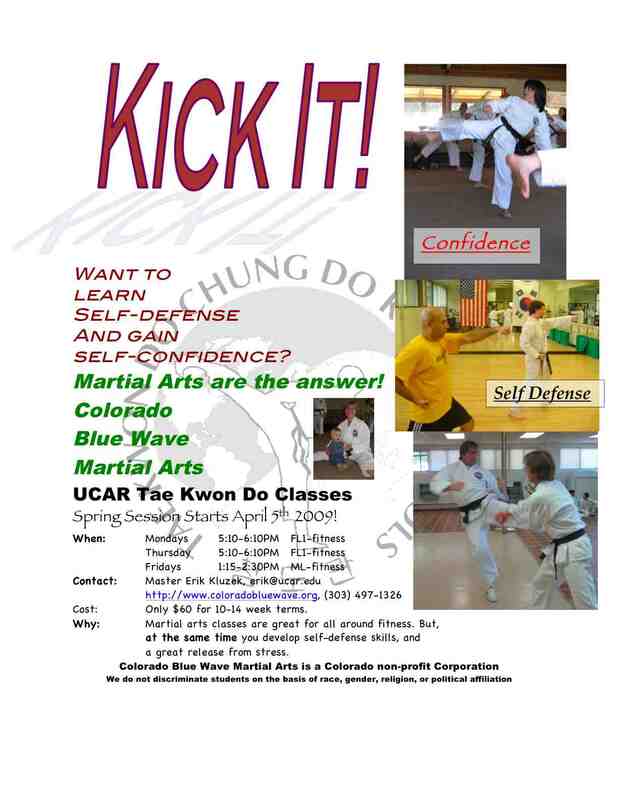 These classes are primarily taught by our head instructor 6th Degree Black Belt Master Erik Kluzek. The location is the basement of a church -- Christ Our Savior Lutheran Church in Longmont CO on 640 Alpine Street. 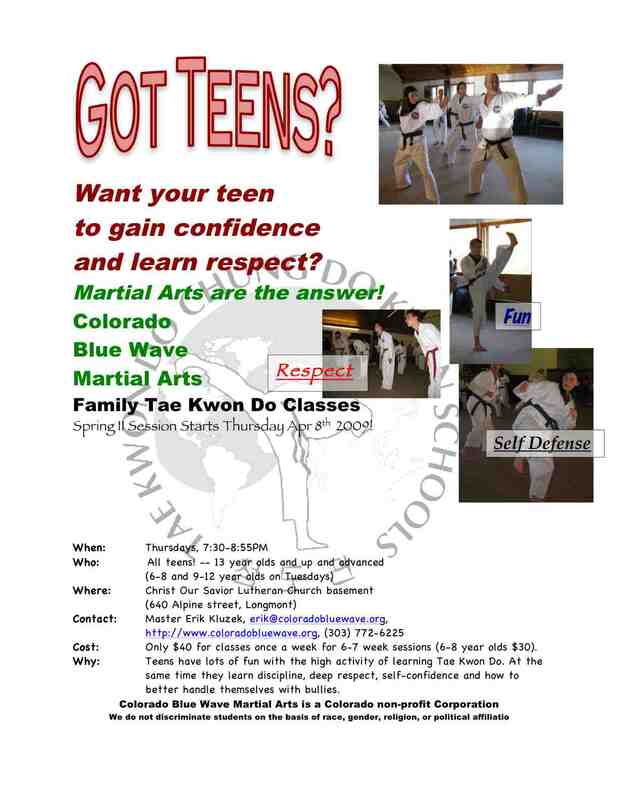 These classes are designed for kids and families.